When you’re trying to shoot a group photo, you often have to back up to get everyone in the picture. What if you wanted to get a photo of the entire Earth. How far would you have to back up? I’ll answer that question in today’s blog. Everyone knows that NASA studies outer space. But NASA also devotes considerable resources to the study of Earth. Our first view of the whole Earth was that classic photo (below) taken during the Apollo 8 mission in December of 1968. Click on the thumbnail to enlarge. On its way to the Moon, Apollo 8 was some 19,000 miles (30,000 km) from Earth when the above photo was taken. To scale, that would be a distance of about 2.5 Earth-diameters — right around where that yellow × is located. The distance to the Moon is about 12 times farther. Using the cameras available, Apollo 8 had to get at least that far from Earth to fit the whole planet into one view. That first whole-Earth image was probably taken by Bill Anders (all three astronauts operated the camera). 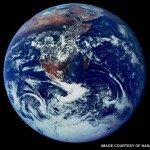 It engendered the term Blue Marble, and changed our philosophical view of our Home Planet, and of ourselves. Buckminster Fuller reacted by coining and popularizing the term “Spaceship Earth” in his classic Operating Manual for Spaceship Earth. For comparison, the yellow dot (graphic at top) marks the altitude at which the International Space Station (ISS) orbits. That altitude is 230 miles (370 km), same as where the now-retired Space Shuttle would orbit. It’s not that far to space, when you think about it. It’s just really tough getting there. If you wanted to photograph the entire Earth from that distance, you’d need a fish-eye lens to pull it off. And even then, you’d see far less than half the Earth’s surface. 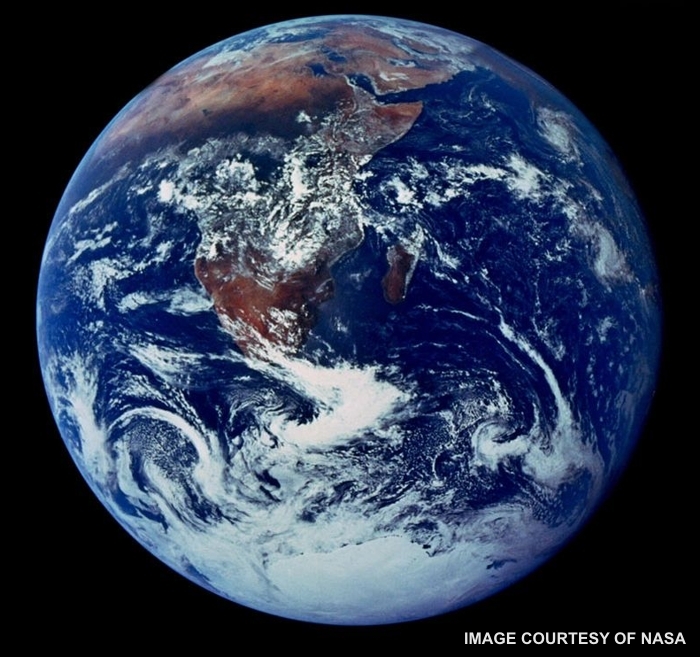 That Earth image at top is from NASA’s Blue Marble: Next Generation project. It’s a lower resolution image, with some latitude and longitude lines included for reference. NASA’s ultimate goal is to capture high-resolution images of the entire daytime surface of the planet, avoiding cloud cover to whatever extent possible, and stitching them together seamlessly. 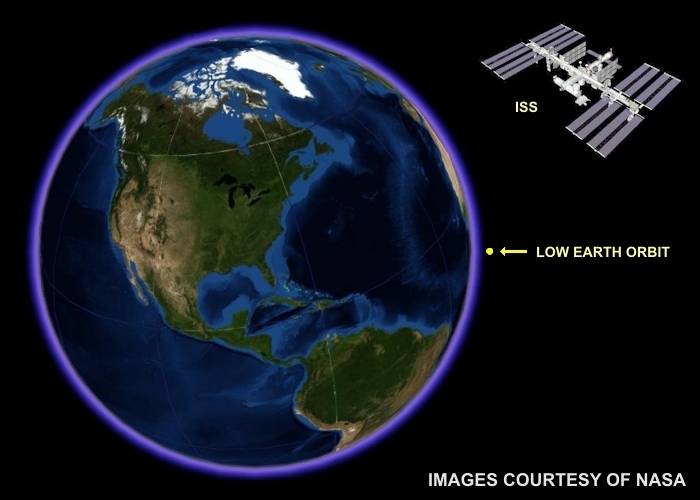 They want to produce the best-ever view of what Earth looks like from space. Obviously, the final product contains data spanning an extended time period. On any given day, clouds cover about 2/3 of the planet. If you have some time to browse that Blue Marble website, it’s well worth a look. Their high-resolution images are absolutely stunning. The highest resolution is 21,600 x 21,600 pixels (416 MB)! One thing I really like about the image at top is how it accurately portrays Earth’s atmosphere. That’s the thin blue shell around the circumference. People are usually surprised at how “thin” it is. Note that the solid Earth has a diameter of about 8000 miles (12,750 km), whereas the atmosphere only goes up about 60 miles (100 km). And for all practical purposes, the atmosphere is only that brighter blue area. That would include the troposphere (where most weather happens). It also includes the stratosphere, so named because it’s layers are stratified, with the temperature coolest at the bottom, and increasing with altitude. The darker blue around that corresponds to the outermost atmosphere, which thins steadily to the black vacuum of space.